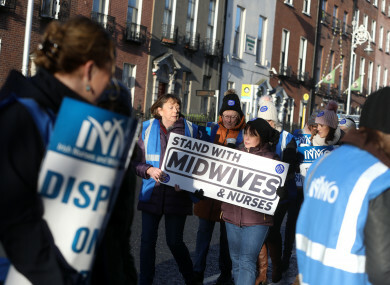 WITH THEIR STRIKE set to enter a third week, nurses and midwives are taking to the streets of Dublin this afternoon to urge the government to take action to end the dispute. The march will begin from the Garden of Remembrance in Parnell Square at 12.30pm, and go to the back of Leinster House at Merrion Square. The nurses and midwives are set to be joined by family and other supporters on the march, and Irish Nurses and Midwives Organisation (INMO) president Martina Harkin-Kelly said they’ve been “deeply humbled” by the support of the public for the strike. “I’m asking anyone whose lives have been touched by nurses and midwives to stand with us [today],” she said. This dispute must be resolved. Nurses and midwives are united and the public stand with us. Now it’s time for the government to make serious proposals to avert more strike. Further strike days are set to take place this Tuesday, Wednesday and Thursday after the second and third days of strike action took place this week. INMO members are striking over pay and conditions, but the government has so far refused to countenance granting pay rises, saying that it would be unfair to other public servants. Speaking this week, Minister for Communications Richard Bruton said the only precondition set by the Taoiseach before talks between both sides could resume was the solution has to be “fair, affordable to the taxpayer and not to have a greater knock-on impact on 400,000 other public servants who need to be treated fairly”. Taoiseach Leo Varadkar also admitted this week that it was “discourteous” to offer to engage with nurses’ unions through a press release. An opinion poll of more than 1,000 adults carried out by Ámarach Research for Claire Byrne Live found that almost eight in 10 people (78%) support nurses’ continuation of strike action. The poll, carried out on Monday, shows a 4% increase in support for the strike action, compared to another survey carried out last week. Over 68,000 people have signed an INMO petition supporting nurses and midwives. Email “Nurses, midwives and their supporters to march across Dublin today”. Feedback on “Nurses, midwives and their supporters to march across Dublin today”.